Torrin Andrews, a 6’2 guard from Riviera Beach Suncoast, had some solid moments on Saturday. He proved to be quick to the basket when taking his defender off the dribble. Andrews also shot the ball well from the perimeter, especially off the catch with his feet set. He was also a quick and active defender. R.J. Duhardt, a 6’8 forward from Delray Beach Atlantic, looks to be one of the better “bigs” in South Florida in the Class of 2019. He’s a quick leaper, is fast up and down the court in transition, and rebounds his area well. Duhardt seems to score best on the move, whether on the break, set play lobs, or when cutting into the lane. Aamir Justice, a 6’3 guard from Delray American Heritage, caught our attention with his ability to pull up and knock down jumpers inside the arc; few players do that much in today’s game. Though a bit on the thin side at this stage, he showed a knack for getting the ball in the basket as well as making good decisions when leading the break. Clarence Cummings, a 6’4 guard from Orlando Evans, had things going well in an early morning game. He displayed a diverse offensive game by hitting a trio of threes, posting up smaller players and scoring down low, and driving to the basket, often earning a trip to the foul line. Cummings appeared to be a solid athlete and plays the game with a cool and calm demeanor. Chance Napier, a 6’5 wing from Gulf Breeze, just outside of Pensacola, was one of the more pleasant surprises of the day. Don’t underestimate him because of his curly red hair or somewhat stocky build. Napier played hard, hit shots from deep, and finished thru contact at the rim. An active defender and rebounder at both ends, Napier seemed to have a knack for coming up with 50/50 balls and making the right play at the right time. Sam Brown, a 6’2 wing in the Class of 2021 out of Georgia looked quite at ease playing a few levels up. A solid combo guard, he scored the ball well from different angles and distances on Saturday. He also made some tough finishes around the rim and proved to be a solid passer. Brandon Farmer, a 6’5 forward from South Sumter out of Bushnell, isn’t a “big” in the true sense of the term but his was quite productive around the basket on Saturday. He didn’t post up so much as he got into the lane, made himself big and available, and scored quickly before the defense could react. Farmer did connect on his lone jumper and showed he could score off the dribble on drives from the high post and along the baseline. Trevaughn Cason, a 6’2 guard from Orlando Edgewater, played with a ton of confidence on Saturday and was quite productive. The combo guard played hard at both ends challenging opponents to keep him from the basket on the offensive end while playing physical and aggressive on defense. He turned several steals into scores and became a frequent visitor to the foul line during the contest. 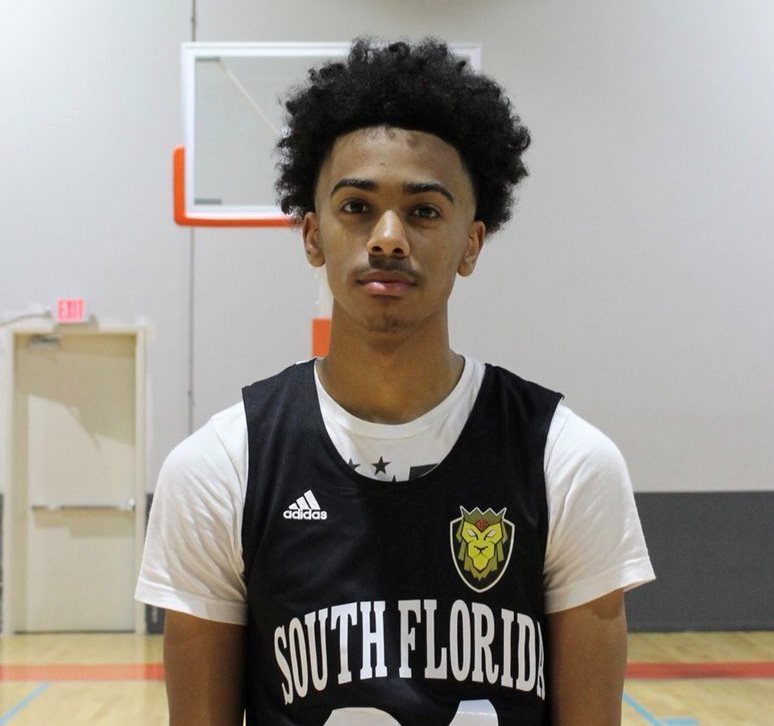 Linton Brown, a 6’4 wing from Wellington, maybe the next star for the Wolves, a program that has become a power in Palm Beach County in recent years. A strong-framed wing, Brown scored well from the perimeter, making threes off the catch as well as knocking down shots on pull-ups from mid-range. His strength allows him to be a factor on the glass at both ends of the court. Andru Nixon, a 6’2 guard from Melbourne Holy Trinity, was a bright spot in the team’s game on Saturday. In a game against a superior opponent, he didn’t back down and played with confidence. He scored well on some drives, converted open shots from the perimeter, and rebounded well from his guard position.